Socialia is Premium and Free WordPress Templates for the Organizations working on Social Issues, Environment, Humanities, Charities etc. D5 Socialia theme for WordPress is sophisticated, lightweight, and adaptable. This theme is better for Social Organizations basically for the organizations working for Climate Change, Disaster Management, Natural Resources Management, Environment, Environmental Management, Social Works, Social Deveopemnt, Cultural Organizations etc. 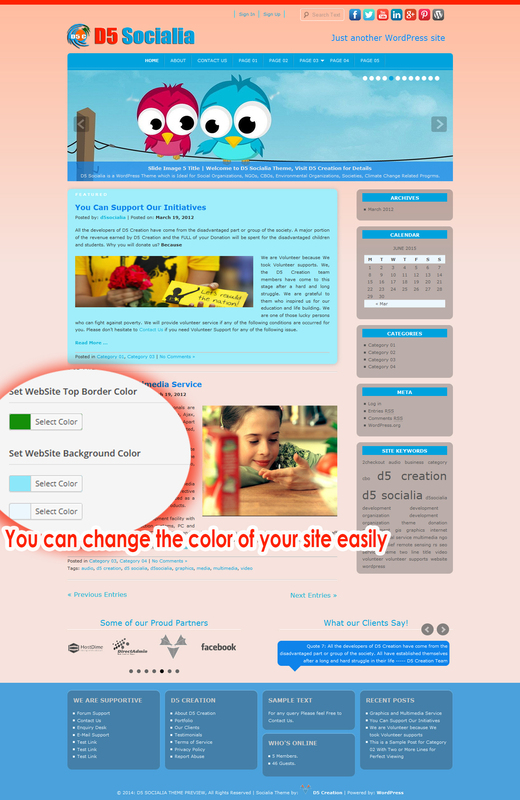 It can also be used for Personal or Company Websites. Extend Version has Advanced Functionalities and can be downloaded by the ONE THEME and DEVELOPER Members Only! Extend Version has More Theme Features which will give freedom to the developers and the theme will be a frame of a complete CMS. Featured Images and Post Titles can be shown as sliding images easily in this special version. Users will take the decision which Featured Images and Posts can be shown as Sliding. ONE THEME and DEVELOPER Members can completely disable the Comments Box, Logged In User Admin Bar, Creditline if want. This Version can show the Site Logo or Company Logo and Site Link in the Login Page instead of WordPress Logo and Link. Log In and Membership Registration are also available in this Theme Version. More Features will be added soon. Featured Images and Posts can be shown as Slide Images.